Here are the Britannia Simba. 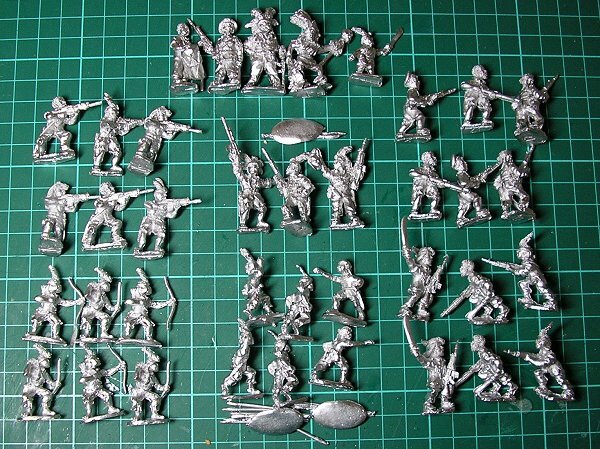 This lot will give me three groups, each consisting of three stands and a single leader figure and a big personality group of five figures (I might split this into a three and a two) with a stand of rifle armed infantry as a bodyguard. These are the two command stands and a base of infantry for a bodyguard. 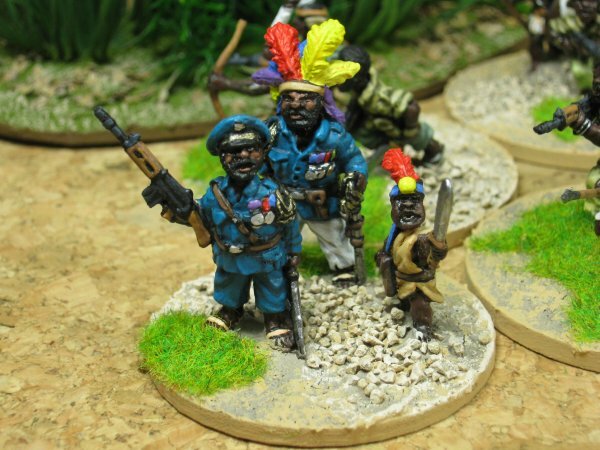 The main command stand shows General Olenga, "Major Bubu," a deaf-mute ex-boxer addicted to hemp who served as personal bodyguard to Rebel Defense Minister Gaston Soumialot and the diminutive "Major Khingisia". I decided to paint the main officers in a kind of RAF blue rather than a variation of green or khaki to make them stand out from the troops. To add to this formidable weapon he's wearing a stylised lion mask as well. Next are the infantry. 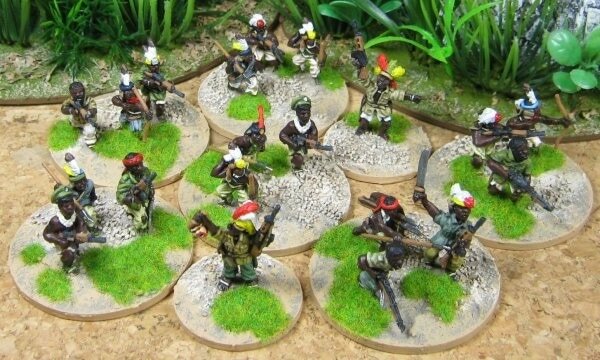 They are organised into 'platoons' of three stands and a commander. The Simba wore chicken feathers and monkey fur as ornaments but I have elaborated a little and allowed the officers and commanders to have some brightly coloured plumes to reflect their importance. Each infantry stand contains a mixture of old and young fighters armed with modern rifles, bows and spears. They are dressed in a mixture of cast off uniforms and ragged tribal wear. Machetes feature extensively, it won't be a lot of fun for any unfortunate enemy that falls into their hands. Finally a close up of the commanders. In early 1964, a new crisis broke out as Congolese rebels calling themselves "Simba" (Swahili for "Lion") rebelled against the government. They were led by Pierre Mulele, Gaston Soumialot and Christophe Gbenye who were former members of Gizenga's Parti Solidaire Africain (PSA). The rebellion affected Kivu and Eastern (Orientale) provinces. By August they had captured Stanleyville and set up a rebel government there. As the rebel movement spread, discipline became more difficult to maintain, and acts of violence and terror increased. Thousands of Congolese were executed, including government officials, political leaders of opposition parties, provincial and local police, school teachers, and others believed to have been Westernized. Many of the executions were carried out with extreme cruelty, in front of a monument to Lumumba in Stanleyville. In July 1964, Moise Tshombe replaced Cyrilla Adoula as Prime Minister of a new national government with a mandate to end the regional revolts. Tshombe had been the leader of Katanga when that province tried to secede. It was therefore highly ironic that he was chosen to lead the Congolese central government in a war against another rebellious province. Among his first moves, Tshombe recalled the exiled Katangan gendarmerie and recruited white mercenaries, integrating them with the ANC. Many of these mercenaries had fought for Katanga when Tshombe was leader of the breakaway province. 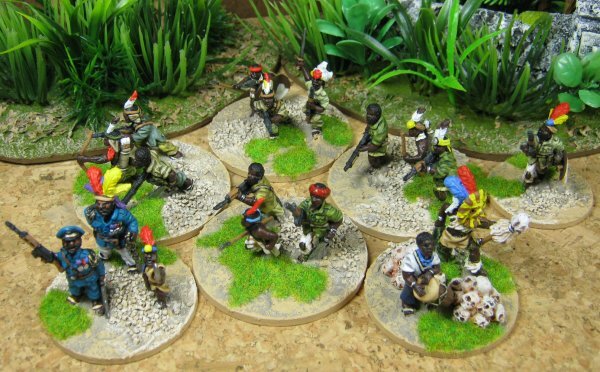 By early August 1964 Congolese government forces, with the help of groups of white mercenaries under their own command, were making headway against the Simba rebellion. Fearing defeat, the rebels started taking hostages of the local white population in areas under their control. Several hundred hostages were taken to Stanleyville and placed them under guard in the Victoria Hotel. The Congolese government turned to Belgium and the United States for help. In response, the Belgian army sent a task force to Leopoldville, airlifted by the 322nd Air Division United States Air Force. Washington and Brussels tried to come up with a rescue plan. Several ideas were considered and discarded, while attempts at negotiating with the Simbas failed. The task force was led by the Belgian colonel Charles Laurent. 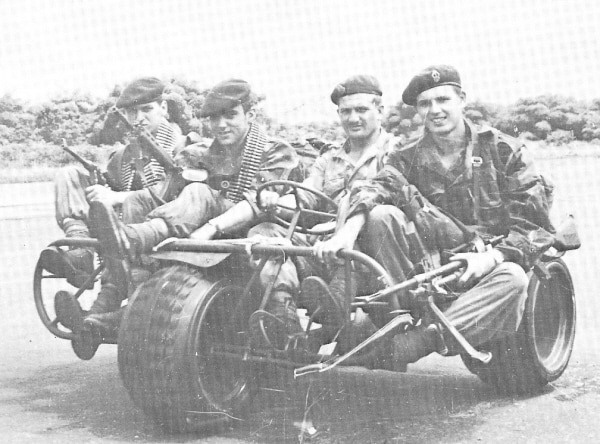 On 24 November 1964, five US Air Force C-130 transports dropped 350 Belgian paratroopers of the Para-Commando Regiment onto the airfield at Stanleyville. 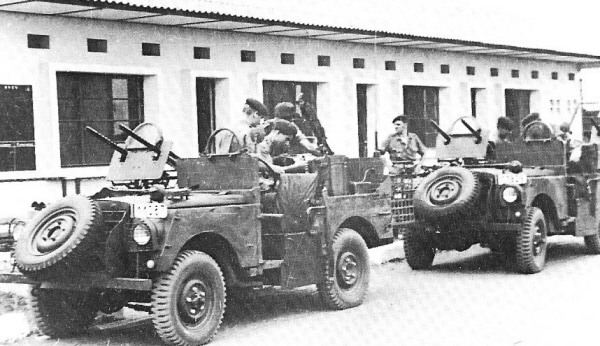 Once the paratroopers had secured the airfield and cleared the runway they made their way to the Victoria Hotel, prevented Simbas from killing all but some 80 of the hostages, and evacuated them via the airfield. Over the next two days over 1,800 American and Europeans were evacuated as well as around 400 Congolese. 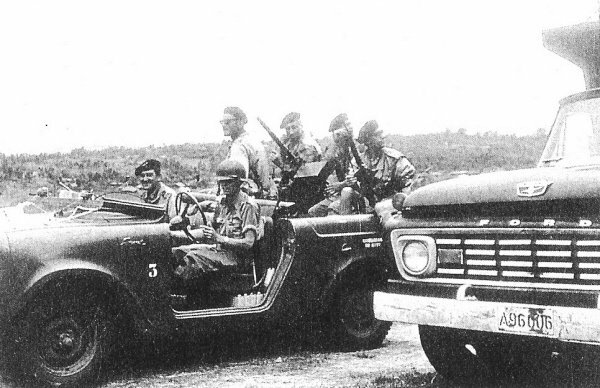 The operation coincided with the arrival of ANC and other mercenary units at Stanleyville which was quickly captured. It took until the end of the year to completely put down the remaining areas of rebellion. 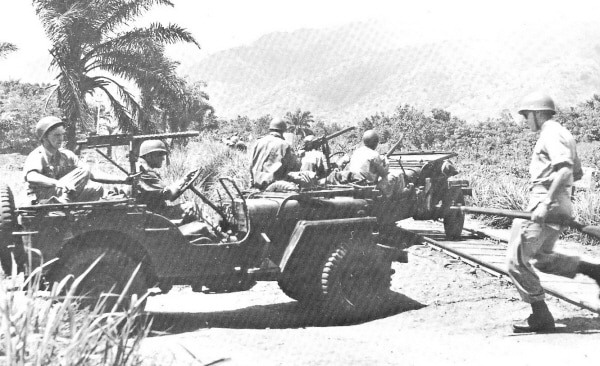 Tshombe's prestige was damaged by the joint Belgian-US operation which saw white mercenaries and western forces intervene once again in the Congo. 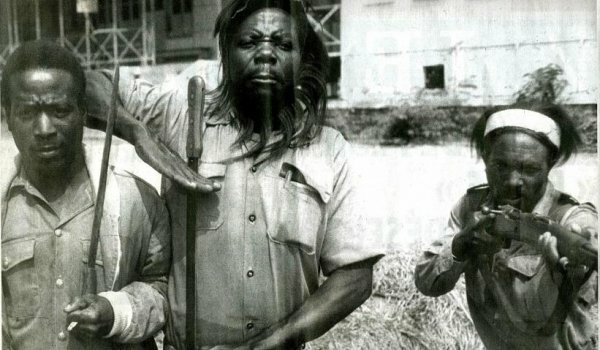 In particular Tshombe had lost the support of both Kasa-Vubu and Mobutu. Shortly after Dragon Rouge, Cuban revolutionary Che Guevara addressed the UN General Assembly on December 11, 1964, publicly denouncing the operation as an "unacceptable intervention [...] A case without parallel in the modern world," that illustrated "how the rights of peoples can be flouted with absolute impunity and the most insolent cynicism." In April 1965, Guevara himself, along with a small unit of Cuban fighters, arrived in Dar es Salaam and made their way across Lake Tanganyika to the Congo, where they were to lead rebellions against the Kasavubu-Tshombe central government for six months, until their retreat on November 20.